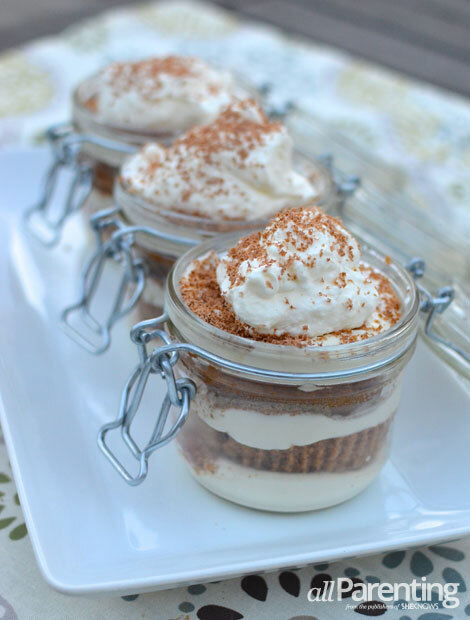 Everyone loves eating out of Mason jars and who doesn't love a scrumptious tiramisu dessert? Layers of chocolate, cream and coffee make for a beautiful and popular dessert! Swap out water for freshly brewed coffee, add some cocoa powder and cinnamon in your cupcakes, and you are well on your way to an easy and delicious tiramisu dessert! Once cooled and cut in half horizontally, you’ve got yourself perfectly round little cakes that fit perfectly inside a Mason jar. Whip up some French Neufchâtel cheese with Greek vanilla yogurt, some whipping cream and sugar for a creamy and tasty tiramisu cheese layer. Don’t forget the chocolate! Use a zester to finely grate a semisweet chocolate bar for your tiramisu chocolate layer. Top each Mason jar with homemade whipped cream, and you’ve just made a scrumptious dessert that any family member, friend or dinner guest will absolutely adore. Preheat oven to 350 degrees F. Place muffin tin wrappers in a 12 muffin tin pan. Prepare cake mix substituting coffee for water. Add oil, eggs, cocoa powder and cinnamon. Bake according to package directions, about 15 to 20 minutes. Cool cupcakes in muffin pan and then transfer cake muffins to wire rack to cool completely. Once cooled, cut muffins in half horizontally. Set aside. In a medium bowl, beat together Neufchâtel cheese, 1/2 cup of heavy whipping cream, yogurt and 4 tablespoons of the sugar on medium speed until blended and fluffy. Beat remaining 3/4 cup heavy whipping cream with 1 tablespoon sugar in another small mixing bowl to make homemade whipped cream. Set aside. Spoon 1 tablespoon of Neufchâtel cheese mixture into bottom of Mason jars. Grate about 1 teaspoon of chocolate over cheese mixture. Top with a cupcake half. Spoon 1 tablespoon of freshly brewed coffee over cupcake half to soak into cake layer. Top with another tablespoon of Neufchâtel cheese mixture, followed by another teaspoon of grated chocolate, cupcake half and tablespoon of coffee. Top with another tablespoon of Neufchâtel cheese mixture, followed by grated chocolate and a dollop of homemade whipped cream. Add more grated chocolate to the top. Repeat with each Mason jar. Refrigerate Mason jars until serving. Enjoy!